John Chumack took this photo of sunspot AR 1785 from his backyard in Dayton, Ohio on July 7, 2013. Despite some relentless clouds, photographer John Chumack managed to capture two spectacular photos of the massive, Earth-facing sunspot AR 1785. "I took these shots from my backyard in Dayton, Ohio on July 7, 2013, in between a couple of sucker holes in the clouds, the first time we had even seen the sun in a week," Chumack wrote SPACE.com in an email. 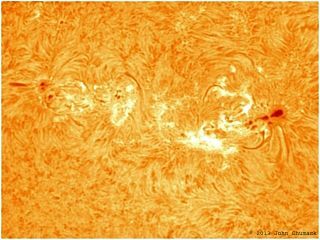 Sunspots are dark, active areas on the surface of the sun resulting from the interaction of plasma with the sun's magnetic field. Most occur in two mid-latitude bands on either side of the sun's equator. They are typically cooler regions that reach about 3,800 degrees Kelvin (6,400 degrees Fahrenheit, or 3,500 degrees Celsius). While this is much cooler than the rest if the sun, a single sunspot is still 10 times brighter than the full moon. By keeping track of sunspots, scientists can measure the activity of the sun. Chumack took the full-disk image his a DMK 31AF04 camera and Lunt 60mm/50F Hydrogen Alpha Solar Scope at 1/436 second, with 740 frames stacked in Registax 6. The close-up photo of the sunspot group AR 1785 was taken with his DMK 21AF04 camera and 2X barlow with the same telescope at 1/77 second exposure. John Chumack took this photo of the sun with sunspot AR 1785 from his backyard in Dayton, Ohio on July 7, 2013. Warning: Never look directly at the sun through binoculars, telescopes or with your unaided eye. Severe eye damage, and even blindness, can result. Astronomers use special filters to safely observe the sun and protective glasses are required for solar eclipse viewing.